CELIA welcomes the romantic month of February! 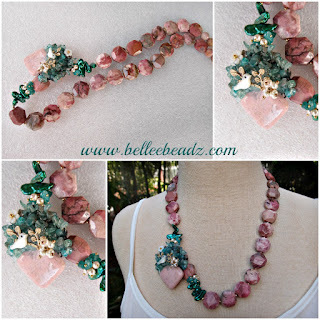 Handcut, faceted Rhodochrosite measuring approx 14mm x 14mm, dyed biwa freshwater pearls, clusters of apatite and pearls and a gorgeous side focal featuring a rhodochrosite pillow, embellished with mother of pearl bird and flowers, freshwater pearls and apatite chips. Gorgeous to say the least.